At Oklahoma Gold Gymnastics we call our 3-year-olds Rompers. The Rompers are without a parent in order to learn how to stay with a group, develop independence from their parent and begin to understand and follow directions. 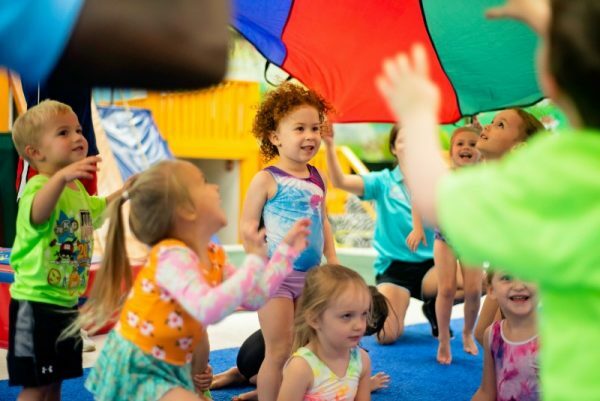 The Romper program will build on these concepts while introducing your child to physical activities that will engage their imagination while developing motor strength, coordination and early gymnastics fundamentals. Our Tumbletown gym is designed exactly for this purpose. Rompers will climb on rock and rope walls, ride Ziplines, triple swings, and bungee jumpers, and learn to execute skills on trampolines, trapezes, beams, and bars. There will be six Rompers per coach. The class rotates to a new station every 12 minutes. They will be building and growing their muscles every class, but that’s not all we care about at OKG. Your child will also build their confidence and self-esteem, which are our most important building blocks for this age group.